Do You Remember... "Tim McCoy Show"
Following his 16 year starring days in silent and talkie westerns (‘26-‘42), Tim McCoy became a live local TV pioneer on L. A.’s KTLA. 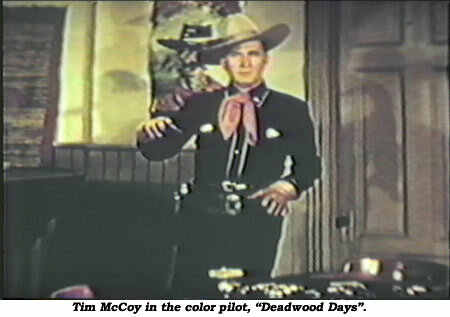 The half hour “Tim McCoy Show” aired Saturday evenings (2/25/50-3/1/52). McCoy gregariously related historical west stories and legends. Iron Eyes Cody and Indian dancers from various tribes were guests. An Indian sign language lesson was given each week. The show was followed by one of Tim’s Monogram, Victory, Puritan or PRC movies; none of the Columbias were shown. After two years, “The Tim McCoy Show” moved over to rival CBS affiliate KNXT. Still a half-hour on Saturdays, it aired from 3/15/52-3/14/53, no longer followed by a movie. KNXT also gave Tim a second weekday show, “Tim McCoy’s Wild West” (3/10/52-10/2/53), where, alone, he lectured about the history of the real West. I interviewed Tim in 1970, while he was traveling with Tommy Scott’s Country Caravan, and he fondly recalled, “It was a one man show. Sort of a ‘Death Valley Days’ except I didn’t have any film. I’d play all the characters and had a set built full of props, guns and maps. I’d go around the set picking these things up, telling a western story. I’d play for a half hour without ever stopping and without a script.” Tim’s memory was a bit off, as the 39 shows were only 15 min. and brief stock footage film clips were sometimes interspersed under Tim’s narration for dramatic effect. 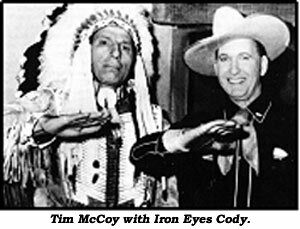 When “Tim McCoy” was sold into syndication by Mercury in ‘53-‘54, the pilot was not included and Iron Eyes’ opening was replaced by titles superimposed over western film stock footage. Although these were reportedly produced in color on 35mm film, only a few 16mm prints seem to remain for collectors. In 1955, pleased with the success of their 15m “Tim McCoy”, Mercury made a pilot for a more ambitious series, “Indian Agent” starring Tim McCoy as Lightnin’ Bill Carson, the same character McCoy played in several B-westerns, except on TV he would be an Indian Agent. Tim McCoy described his wife, Inga Arvad, in his 1977 bio, TIM MCCOY REMEMBERS THE WEST, as “Danish and lyrical”. Born into Copenhagen high society in 1913, Inga, as a foreign correspondent, was granted exclusive interviews with Adolf Hitler in 1935-‘36. Hitler spoke of her as the personification of Nordic beauty. Sounded out by the Germans to be a Nazi spy, Inga refused and fled the country in 1939, relocating in Washington, DC, as a syndicated columnist in 1940 where one of her co-workers was Kathleen Kennedy, JFK’s sister. In 1942, Inga, 28, had an affair with John Kennedy, then a young (24) naval ensign. She later wrote, “At that time, he was a boy, not a man.” The FBI still suspected Inga of being a spy because of her social pre-war association with Nazis Goering (she broke the newspaper story of his upcoming marriage to second rate German actress Emmy Sonnemann), Goebbels and Hitler. Kennedy’s father, thinking even then of his son’s future, broke up the liaison. 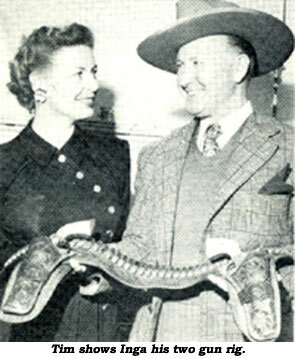 Inga later worked at MGM and, for a time, took over Sheliah Graham’s Hollywood column. In 1946, at 55, McCoy met and married Inga when she was fashion editor for HARPER’S BAZAAR. She died in ‘73.